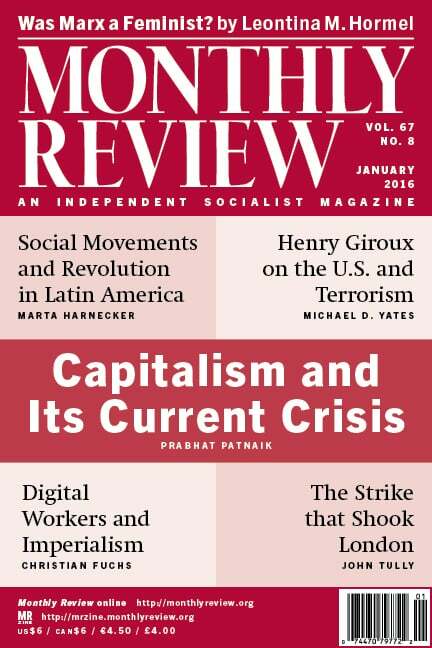 Prabhat Patnaik’s Review of the Month in this issue addresses problems of economic stagnation and imperialism in the context of explaining the current global crisis. Patnaik is part of a broad tradition of Marxian thought and heterodox economic analysis more generally that has long focused on issues of economic stagnation under monopoly capitalism. Such questions are now finally being taken up even by orthodox economists, but in ways that systematically ignore decades of contributions in this regard made by heterodox theorists. Ever since Larry Summers raised the issue of secular stagnation (referring back to Alvin Hansen’s theory of the 1930s and ’40s) at an IMF meeting in 2013, the question of stagnation has become part of a worldwide economic debate, moving issues that were once on the margins to center stage. This has resulted in a proliferation of mainstream economic treatments of the history of the secular stagnation concept in the 1930–1950s period, after which mainstream economists had essentially declared the issue dead. Nearly all of these current orthodox (i.e., neoclassical) analyses of the history of stagnation theory turn a blind eye to the role of Marxian and heterodox thinkers, who have been developing the stagnation thesis in great historical and theoretical detail for more than half a century, building on the debates of the 1930s. This has particularly been the case in Monthly Review, and in the work of such theorists as Michał Kalecki, Josef Steindl, Paul A. Baran, Paul M. Sweezy, and Harry Magdoff—among the most noted dissenting economists of the twentieth century. The concept of stagnation (or secular stagnation) has undoubtedly appeared more frequently and been analyzed in greater detail in MR than any other publication in the world over the last sixty years, as part of a running cri-tique of capital accumulation. Yet in most current orthodox economic discussions of the topic, Monthly Review is seldom mentioned. This is not due to any ignorance of MR‘s contributions. For example, when we asked Larry Summers not long ago whether he was at Sweezy’s talk on “Why Stagnation?” at Harvard in 1982, the first answer we got back from him was that he might have been, followed almost immediately by another answer from his staff that he probably was not. Yet it was clear from the nature of the response that Summers was aware of Sweezy’s ideas (“Notes from the Editors,” MR, October 2014). In a November 23, 2015, online article entitled “Printing Money,” The New Yorker‘s talented economic columnist John Cassidy observed that the “phrase of the moment” is “secular stagnation,” and that “Lawrence Summers resurrected it a couple of years ago.” No mention is made of Sweezy and other thinkers on the left, although Cassidy is well aware, as his earlier book How Markets Fail (2009) showed, of Sweezy’s stagnation argument and its importance. The thing that drives me up the wall is when mainstream economists (meaning neoclassical economists), after years and years of pushing a bad idea on the public and students, turn to, when finally admitting that their bad idea is really a bad idea, and claim a good idea that they ignored and kept on the fringes. [Paul] Krugman’s recent post [on secular stagnation] serves as an excellent example.… Though it’s about the idea of how the current recession (or stagnation) could be the “new normal,” it…makes no mention of the long and rich research on this very subject by Marxists (most notably the late Paul Sweezy) at the Monthly Review. We were pleased to learn this fall that Tamás Krausz’s Reconstructing Lenin: An Intellectual Biography (Monthly Review Press, 2015) won the 2015 Deutscher Memorial Prize (named after Isaac and Tamara Deutscher). The prize is given each year to a book that the Deutscher jury considers to exemplify the best and most creative new writing in relation to the Marxian intellectual and political tradition. MR authors who have won the Deutscher Prize in prior years include István Mészáros (1970); G.E.M. de Ste Croix (1982); Ellen Meiksins Wood (1986); Teodor Shanin (1987); Boris Kagarlitsky (1988); Terry Eagleton (1989); Arno J. Mayer (1990); Harvey J. Kaye (1993); Justin Rosenberg (1994); Eric Hobsbawm (1995); Peter Gowan (2000); Michael Lebowitz (2004); Kees van der Pijl (2008); David Harvey (2010); David McNally (2012); and Sam Gindin and Leo Panitch (2013). Nevertheless, the 2015 prize for Krausz’s Reconstructing Lenin represents the first time that a Monthly Review Press book has received the Deutscher Prize—an accomplishment of which we are proud. Krausz’s book is an extraordinary attempt to contextualize Lenin’s theory and practice in the historic struggles and debates of his time. In István Mészáros’s words, it is “a work of exemplary scholarship, written with penetrating insights and steadfast commitment. With richly documented attention to detail it illuminates the formation and much-disputed impact of Lenin’s immense lifework in their historical setting, highlighting at the same time their enduring significance for the prospects of socialist development.” Readers of Krausz’s book will be surprised by what his adept use of the historical method allows him to reveal in relation to all the major historical themes associated with Lenin’s approach to revolution and socialism. In addition to being the author of Reconstructing Lenin and Professor of Russian History at Eötvös Loránd University of Sciences in Budapest, Krausz is also president of the editorial board of Eszmélet, the only Marxist theoretical and political quarterly in Hungary. The latest issue, number 107, includes a translation of MR editor John Bellamy Foster’s “Chávez and the Communal State” from the April 2015 issue of MR, along with an article on equality and democracy by Mészáros—as well as a picture of Mészáros on the cover to celebrate his 85th birthday. Happy Birthday, István! Leontina M. Hormel, whose review “Marx the Feminist?” appears in this issue of MR, has recently assumed the position of chair-elect of the Marxist Sociology Section of the American Sociological Association. She will take over next year from Brett Clark, the chair of the Marxist Section since August 2015. Clark is a member of the MR editorial committee and co-author with John Bellamy Foster and Richard York of The Ecological Rift: Capitalism’s War on the Planet (Monthly Review Press, 2010). Congratulations to both Leontina and Brett! In this issue we are pleased to publish a 1931 radio broadcast, entitled “No Vacation from Politics,” by the twenty-one-year-old Paul A. Baran, presented on the brink of Hitler’s rise in Germany. As Nicholas Baran, Paul Baran’s son and the talk’s translator, notes, it aired on a Breslau radio station at a time when the elder Baran was associated with Institute for Social Research in Frankfurt. We think the broadcast is of enduring interest for its conception of the growing and necessary politicization of the human relation to the social and natural environment; its accounts of ideological controls aimed at the depoliticization of the working class; and the insights that it provides into Baran’s early development, decades before he wrote his masterworks, The Political Economy of Growth (1957) and, with Paul M. Sweezy, Monopoly Capital (1966), both published by Monthly Review Press. This talk demonstrates the intellectual maturity at a young age of one of the great Marxian political economists of the twentieth century.